Looking north on Park Terrace on Oct. 14, when the weather was still sunny and dry. Getting streets maintained and pavement repaired is always an issue in Albany, but not any more on two streets in a leafy neighborhood at the southwest edge of town. 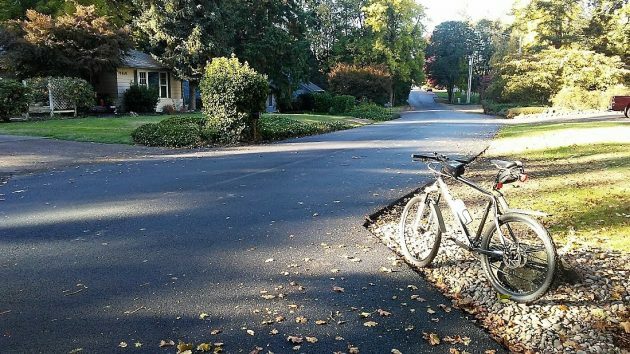 On a bike ride the other day, I noticed that on Lakewood Drive and Park Terrace, for a distance of three-quarters of a mile, the surface had been refreshed with a brand new coat of blacktop. How come, I wondered. And why these streets, when so many in the older parts of town are falling apart without anything happening to fix them? The answer, it developed, is that Lakewood and Park Terrace, despite having been inside the city limits for decades, are still mostly county roads. The County Road Department considered the pavement to be getting bad and did something about it. “Both roads have not had a maintenance treatment of any kind since I’ve been employed by Linn County,” Roadmaster Darrin Lane, who was hired in 1995, told me by email. On a scale of zero to 100, the surface was rated less than 20, which meant close to complete failure. But the substructure was still in decent shape, so after some grinding and a leveling course, a contractor, North Santiam Paving, put on a two-inch layer of asphalt. The cost was $95,922, and of that the city of Albany paid $31,112. Sounds like a case of Pavement Envy. Almost chocked on my triple cheese and bean chalupacabra reading your comment “JH”. Try driving around the corner to Fir Oaks Drive. It really isn’t a cobblestone street even if it looks like it. Long over due for repair or replacement. Surface is disintegrating almost the entire length starting at 29th. The road in front of our house (Bradley St SE) was crumbling to pieces 2 years ago (it had been deteriorating for years), they finally sent in a crew to re-pave it. The road is less than a block long, but they only paved 3/4 of the width. Now the road is beginning to crumble again already. Ridiculous. TC wants to spend the PUBLIC’S money????????? ?